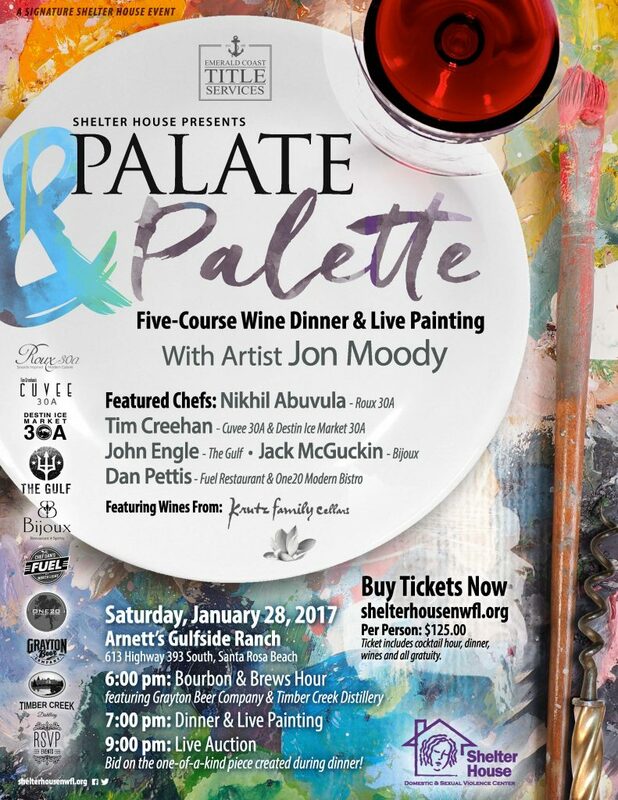 (SANTA ROSA BEACH, Fla.) January 9, 2017 – Shelter House proudly announces its newest signature fundraising event, Palate & Palette: Five-Course Wine Dinner and Live Painting, to be held Saturday, January 28 at Arnett’s Gulfside Ranch in Santa Rosa Beach. The event’s presenting sponsor is Emerald Coast Title Services. The evening begins with a Bourbon and Brews Hour at 6 p.m. with local craft beer and spirits by Grayton Beer Company and Timber Creek Distillery. The seated dinner and live painting begin at 7 p.m. within the rustic chic events barn. The featured chefs include Nikhil Abuvula of Roux 30A, Tim Creehan of Cuvee 30A and Destin Ice Market 30A, John Engle of The Gulf, Jack McGuckin of Bijoux and Dan Pettis of Fuel Restaurant and One20: A Modern Bistro. Each chef will present one course that will be perfectly paired with wines from Krutz Family Cellars of Sonoma County, California. Artist Jon Moody, whose work has been seen on the hit television show “Empire” as well as recognized by the White House, will create a piece of art in front of the audience while they dine. At the end of the evening, guests will have the opportunity to take home Moody’s one-of-a-kind creation in an exciting live auction. Special thanks to RSVP Events for event décor, STM Photography for videography, as well as all chefs, restaurants, and beverage sponsors. Tickets for Palate & Palette are $125 per person and include the cocktail hour, dinner, wines and all gratuity. Tickets are available for purchase now at https://shelterhousepalateandpalette.eventbrite.com. More information can be found on the Shelter House Facebook page at www.facebook.com/ShelterHouseNWFL. Shelter House’s other signature event, Purses with a Purpose, is scheduled for March 24-25 at Grand Boulevard at Sandestin. More information on this event will be announced soon.